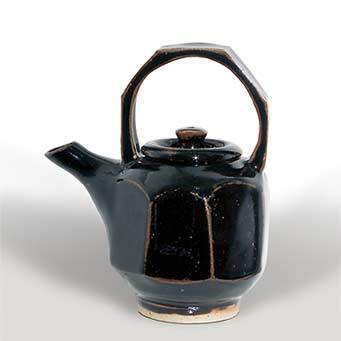 Jeremy Leach tenmoku teapot - 7" (177 mm) high. Jeremy Leach was born in 1941 in Carbis Bay near St Ives where his father, David Leach, was working at the Leach Pottery. He started potting at a very early age - around five - under his father's instruction. He started the Central School of Arts and Crafts in 1961, and around 1963, with the help of remuneration from a part-time office job with the Church, he set up Craft Pottery in church premises at St Georges Road, Borough, near the Elephant and Castle in south-east London. In 1965 Jeremy went to the Lebanon and stayed there a year. Work from this period is marked 'SAY'. On his return to England he taught at Harrow School and at Morley College in London. Since 1970 he has lived at Bovey Tracey in Devon, near to his mother and father, and has potted, on and off, at Lowerdown Pottery.